What Should I do for my Residential Awning in Winter? Though it seems as though we only just got underway with the fall season, it is never too early to start preparing for winter. Before you know it, temperatures will plummet, roads will be icy, and snow will start to fall. Knowing that there will be inclement weather ahead, many homeowners begin looking for ways to keep their property safe and protecting now so that they are not caught off guard. 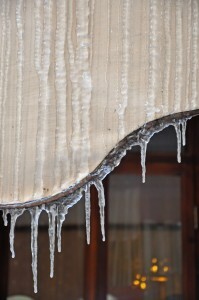 One thing in particular that you will need to consider is how to properly deal with your residential awning in winter. Read on to find out what your options are! While awnings are designed to be durable, water-resistant, and long-lasting, the fact remains that excessive snow and ice could potentially cause damage to them. You want to protect your awning investment, so what can you do? One method of trying to keep your awning in good condition throughout the winter is to be mindful of snowfalls and remove heavy snow from your awning as soon as possible. By sweeping off excess snow, you will help ensure that your awning does not sag or tear under the weight of it, and you can even stop ice from forming underneath of the top layer of snow. You may need to do this many times throughout the winter, but it can help extend the life of your awning. If you are looking for a more permanent, lower-maintenance solution to keeping your residential awning safe in winter, consider Carroll Awning’s winter storage service. We safely dismantle your awning in the fall and store them properly so that they do not become damaged in inclement weather. Then, once it is spring again, we re-install them so that you can enjoy all the benefits of your awning once more. Small steps like this can go a long way in extending the life and integrity of your residential awning.